There's a very long and well-documented history of mansplaining on the internet, and it doesn't look like the phenomenon is dying down anytime soon. Although men condescendingly explain things to women in every field, I find that mansplaining is usually dominant in "nerd" related circles. God forbid a woman enters a conversation about comic books characters, or Star Wars, or in this case, Indiana Jones. 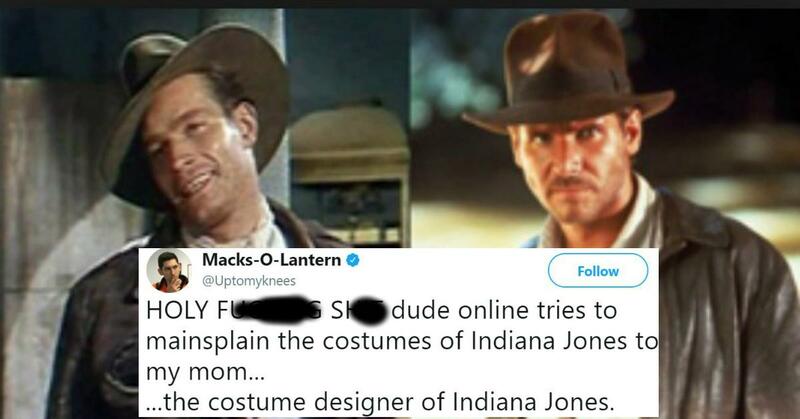 Which is what happened to Twitter user @uptomyknees, (Max Landis, IRL) when he saw some dude trying to mansplain to his mom the original inspiration behind Indiana Jones costume design. The trouble is, his mom was the costume designer behind Indiana Jones, so, you know, she would kind of know what inspired his design... As she was the one to design it, right? 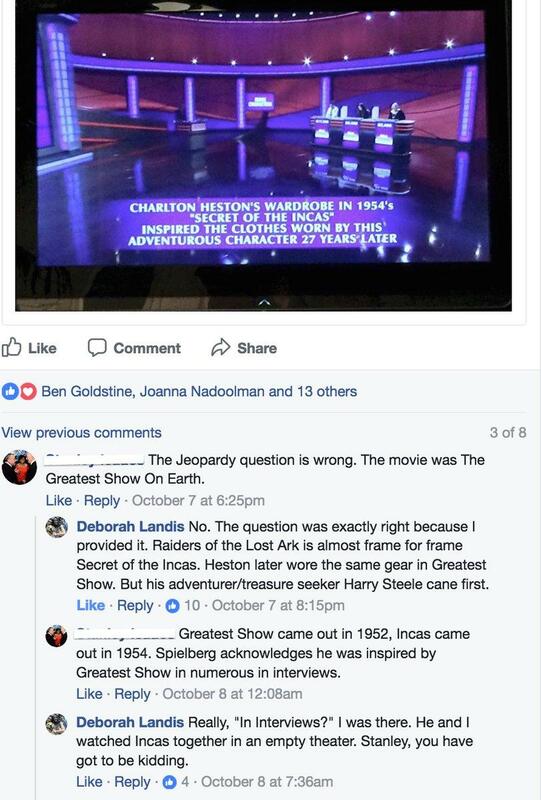 Deborah Nadoolman Landis provided a Jeopardy question (and answer) asking contestants which movie inspired Indy's iconic look. She set the record straight when the dude tried to claim he knew the "true" inspiration behind Indy's choice in wardrobe. The worst part is that the guy doesn't back down after Landis sets him straight. Instead, he doubles down on his original stance and tries to tell Landis, who worked with Steven Spielberg himself and even watched Secret of the Incas with the director to get an idea of the aesthetic he was going for, that she was still wrong. It really is mansplaining at its worst. Especially when Max provides this very telling side by side screenshot of Heston and Harrison in their respective outfits. People were tickled pink by the sheer amount of tea Landis was entitled to for her responses to Stanley, and expressed their love in meme form. I'm with Stanley. Who can see the similarities here? Seriously? Now.....where's my guide dog? 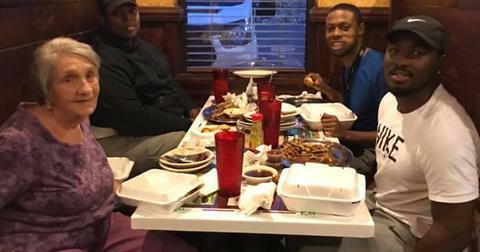 It's just insane to know that an easily Google-able woman, with film credits, will still have her experience doubted by a random Stanley on the internet. But that's mansplaining for ya.